Cindy Bristow was searching for something to help her students (College to 8U) with spin, hand-eye coordination, tracking and a number of other skills. She tried every product she could get her hands on and was not happy with any of them – the weights were not quite right, the size was not quite right or the construction and materials were not right, etc. So, Softball Excellence had our own product engineered exactly to Cindy’s specifications, specifically for softball/baseball skill training. After months of refining and trials we are confident we have nailed it – the Zip Ball™ is an awesome training tool! 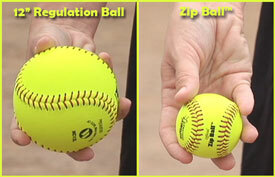 The Zip Ball™ is a softball/baseball training tool that is great for players of all ages, skill levels and positions. Pitchers - Master the snap and spin on your curve, rise, drop & screwballs. Hitters - Improve your vision, tracking and bunting skills. Fielders - Learn better body positioning, receiving skills and tracking skills. Catchers - Improve blocking and glove to hand transfer for quicker throws. Makes a great gift for Softball Coaches and Players! Don't take our word for it, view more Zip Ball™ Success Stories - and learn how coaches all over the country are improving player performance and finding success through use of this fantastic softball/baseball training aid. Just a quick update on the Zip Ball. I LOVE IT!!!! We have used them with our catchers and infielders - really working on getting the ball out of the glove faster. Also incorporated them into our infield and outfield daily ball drills...and combined them with the little gator gloves as well. My favorite use is obviously for pitching! The Zip Ball really lets the girls focus on involving their fingers in all the snaps. As much as I talk about it I was never sure they were understanding or feeling it. With the Zip Ball ball they can. It's almost as if a light bulb went off! They are perfect. Everyone needs to have some!!!! Our pitchers are using them for spin work, and our position players use them with soft hands for fielding and throwing. Our catchers also use them with soft hands to work on quick hands in the transfer and our hitters do tee hitting with Zip Balls as well. They are VERY beneficial for us are probably the single tool that we are most excited about this year! We used the zip ball this last weekend during a pitching clinic and for the first time some of the girls/ladies were able to really fell and actually see the rotation of the ball. Just using it for the pitching clinic was well worth it and so far has been one the best teaching aids I have used.